Pennsylvania Builders Risk Insurance. How much coverage should you buy on a building that is just being built? Builders risk coverage is unusual because the building under construction does not have any value when construction begins. It does not reach its total value until construction is complete and coverage ends. This means that the values at risk are significantly less than the limit of insurance for almost the entire policy period. This situation is why standard property rates are not appropriate. Custom homebuilders, general contractors and even property owners often find themselves searching for insurance coverage to protect personal or business projects under construction. With Pennsylvania builders risk insurance, they can get comprehensive coverage against all construction related risks. Pennsylvania builders risk insurance protects your contracting business from lawsuits with rates as low as $67/mo. Get a fast quote and your certificate of insurance now. While a Pennsylvania builders risk insurance policy itself is relatively simple to obtain, ensuring the proper coverage, limits and policy type are in place requires a core understanding of the industry and the associated risks which occur during the course of construction. Coverage is usually written on an all risks basis (coverage that can exclude only risks that have been specifically outlined in the contract) and typically applies not only to property at the construction site, but also to property at off-site storage locations and in transit. PA builders risk insurance can be written on either a completed value or a reporting form basis; in either case, the estimated completed value of the project is used as the limit of insurance. Profits. Pennsylvania builders risk insurance covers more than just labor, materials and equipment that are needed for new construction project; it can cover profits as well. With this insurance, contractors can be reimbursed for the pro rata percentage of profit earned as of the date of the loss - based on the profit assumptions included in the job estimate. Valuable Papers and Electronic Data. Contractors and construction companies rely on blueprints, schematics and other paper and electronic documents and data in the course of conducting their business. 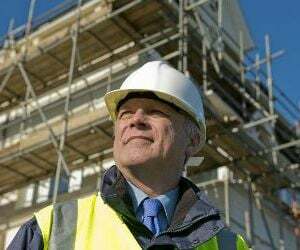 PA Builders risk insurance provides up compensation to research, restore and replace important documents and electronic data that were lost in a covered risk. Modular Components. Businesses often store important and expensive materials and equipment in off-site modular units. With Pennsylvania builders risk insurance, such modular units and components are covered while they are being used for temporary storage or in transit. Location of the storage unit does not need to be listed in the policy. Testing. Construction and contractor businesses often test out newly installed equipment. In the event of a physical loss caused by electrical, mechanical, pneumatic and hydrostatic testing, builders risk insurance policy can help cover the costs of the loss. Broader testing coverage can be added to the Pennsylvania builders risk insurance policy to include boilers, production equipment, pressure vessels and power generation equipment. The PA builder's risk insurance policy will pay for damages up to the coverage limit. The limit must accurately reflect the total completed value of the structure (all materials and labor costs, excluding land value). The construction budget is the best source for determining the appropriate limit of insurance. Request a free Pennsylvania Builders Risk insurance quote in Aliquippa, Allentown, Altoona, Ambridge, Baldwin, Beaver Falls, Bellevue, Berwick, Bethel Park, Bethlehem, Bloomsburg town, Bradford, Brentwood, Bristol, Brookhaven, Butler, Camp Hill, Canonsburg, Carbondale, Carlisle, Carnegie, Castle Shannon, Chambersburg, Chester, Coatesville, Collingdale, Columbia, Connellsville, Conshohocken, Darby, Dormont, Downingtown, Doylestown, DuBois, Dunmore, East Stroudsburg, Easton, Economy, Elizabethtown, Ellwood, Emmaus, Ephrata, Erie, Franklin Park, Gettysburg, Glenolden, Greensburg, Grove, Hanover, Harrisburg, Hatboro, Hazleton, Hermitage, Huntingdon, Indiana, Jeannette, Jefferson Hills, Johnstown, Kingston, Lancaster, Lansdale, Lansdowne, Latrobe, Lebanon, Lewistown, Lititz, Lock Haven, Lower Burrell, McKeesport, Meadville, Mechanicsburg, Middletown, Millersville, Milton, Monessen, Monroeville, Morrisville, Mount Joy, Munhall, Murrysville, Nanticoke, New Castle, New Cumberland, New Kensington, Norristown, Northampton, Oil, Old Forge, Palmyra, Perkasie, Philadelphia, Phoenixville, Pittsburgh, Pittston, Pleasant Hills, Plum, Pottstown, Pottsville, Quakertown, Reading, Ridley Park, Scranton, Shamokin, Sharon, St. Marys, State College, Sunbury, Swissvale, Tamaqua, Uniontown, Warren, Washington, Waynesboro, West Chester, West Mifflin, White Oak, Whitehall, Wilkes-Barre, Wilkinsburg, Williamsport, Wilson, Wyomissing, Yeadon, York and all other cities in PA - The Keystone State.